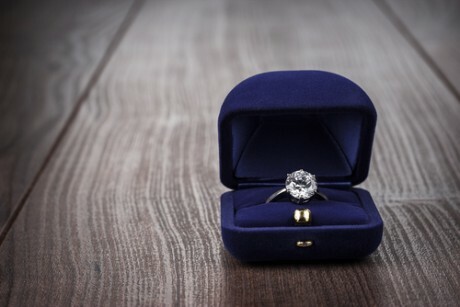 It’s time for another advice from the other gender and today we’re going to be discussing bling bling – namely the engagement ring. Arguably the most important bit of jewellery you’ll ever buy in your life (maybe with the exception of your first grown up watch.) It’s the bit of shiny carbon she’s going to be thrusting at creepy bar strangers to ward them off like garlic to a vampire. It’s the bit of rock that’s going to be glimmering from her finger every damn day. It’s the symbol of commitment and loyalty that your future Mrs is going to be wearing (hopefully) for the rest of her life. So it goes without saying that it’s pretty darn important to get right. After all, getting it wrong could have detrimental consequences. Yep, there’s a lot to think about and it can be a bit overwhelming. So I’m here to bestow upon you some invaluable tips that you’re going to need if you’re thinking about proposing to her. This is just common sense: you don’t want to buy her a ring she’s going to hate. Just remember if you are really stuck then you could always ask her friends or a member of her family for some pointers. After all she may have mentioned something to them in passing or even better, told them exactly what she’s always wanted. Remember it may be your money but it’s her ring. So don’t pick something you like the look of, pick one she’ll love (annoying I know, paying for something you aren’t even going to wear!) Also check her current rings to see what her ring size is: you want her her to be able to wear it! Extra tip :- Another thing you should consider is whether or not to ask her father for her hand in marriage. Some women find it traditional and respectful, others may find it outdated and sexist. So try and asses the situation first before you do anything! The only thing not influenced by nature, this is an important factor to get right as a bad diamond cut will affect it’s sparkle (also known as it’s ‘fire’.) There are a few popular cuts to choose from, the round cut, the pear, the marquise, the princess, the oval, the emerald and the cushion shape. Consider which shape she likes or which shape you think she’d like when making the big purchase. The clarity of a diamond is what most people obsess about and the imperfections (or ‘inclusions’ as they are known in the trade) can affect the diamonds sparkle. So if you want something that’s really going to glimmer and shine then maybe best to remember that so long as the stone isn’t graded a I3 or Imperfect 3 then it’s all good. For more advice on diamond clarity please click here. Not to be confused with Karat which is the measurement for gold. Carat is the weight of a diamond - one carat equals 0.02 grams. It all sounds rather scary but I promise you, it’s not! Because despite what the jewellry companies will have you think, you don’t have to buy a ring equivalent of 2 months salary. Just buy what you can afford and put your heart and soul into picking a ring that she’s going to love. Go here to find out about the carat system. This is a personal thing but I really don’t think you should buy something that important over the internet. Unless you’re dealing with someone serious devoted and knowledgeable like Tiffany & Co. Always go in person so you can look at and compare different rings. Plus the sales associate will be on hand to answer any questions and offer suggestions and/or advice then and there. Very useful if you’re going to be spending a substantial amount of money. I know this is going to sound odd, especially since men don't really discuss wedding-esque topics amongst themselves (a sad stereotype that we really need to change) but chances are, you’ll find yourself wanting to ask your married/engaged mates for help and advice here. So don't be embarrassed - go for it! Because at the very least they'll help put you at ease and you never know, they may be able to recommend some good jewellers who’ll be able to help you out.